Dogs are manipulative with their cute faces and pleading eyes with which they convince us to give them food. In the U.S., dogs have mirrored their human companions whose overweight population has also dramatically increased. This isn’t coincidence – the two are clearly linked. Just as obesity is detrimental to human health, dogs are just as affected by a few extra pounds. The easiest test to perform is the “rib test.” Gently place your hands on your dog’s ribcage and softly palpate the area. You should be able to feel her ribs with slight pressure just underneath a thin layer of fat. However, her ribs shouldn’t be visible to the human eye. Assuming she is not pregnant, the other factor to consider is her belly. It should be firm and curving slightly higher than the chest towards her spine. If her stomach is wobbly and hanging below her ribcage, she is obviously overweight. How deep her chest cavity is in comparison to the curve of her stomach is dependent on the breed. Deep-chested breeds such as greyhounds will have a much larger differential between chest and stomach than a bulldog. The rule of thumb remains the same though. The ribs should not be visible but should be felt with a gentle touch. Peering at your dog from overhead the waist should curve gradually inward from the chest creating an hourglass shape. Even a barrel-chested dog should have a slightly tapered waist. If you don’t see this shape, it’s more than likely that your dog could stand to lose two or more pounds. Hopefully, most of us would know if our dog was getting to the “morbidly obese” stage. The signs would include a neck with rolls of fat, extra padding in the hips and buttocks, and an extremely flabby stomach that hangs low. Your dog may waddle because of the extra weight and you will probably notice that she cannot lie down or stand up without difficulty. It takes years for a dog to get to this stage and she probably won’t reach morbid obesity until she’s middle-aged. Don’t wait for her to get to this stage – monitor her food intake and her figure from the time you adopt her. How Do Dogs Become Obese? We could blame it on our dogs – their soulful, pleading eyes are constantly begging us to feed them juicy dinner scraps or their favorite biscuits. But this is something we need to be accountable for as their caretakers. As our own diets decline in quality and increase in quantity, so do our dogs’ diets. Accordingly, our activity level is directly proportional to our dog’s activity level. Years of a bad diet and no meaningful exercise will almost certainly lead to obesity. If a dog has been overeating most of her life, putting her on a diet will have to be a slow process as restricting her intake severely will cause her too much discomfort and unhappiness. Obesity in dogs has health risks including heart problems, diabetes, glaucoma, and arthritis. Glaucoma seems to affect dogs much more often than humans – and obesity will increase the risk of this disease that is already too frequent in canines. 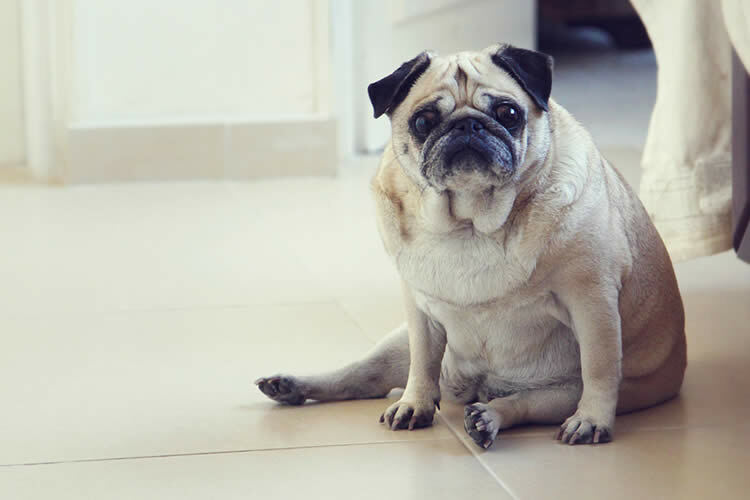 Dogs easily develop hip problems associated with obesity. For long-legged, deep chested dogs, back-knee pain will also accompany the hip problems. Keeping your dog at a healthy weight only has positive benefits – increased lifespan, fewer medical bills, and an ultimately happier dog. Pet MD: How Can You Tell Your Pet Is Overweight?